Recently I had to go super clean with my eating. There were a few weeks where I couldn’t eat any sugar, dairy or wheat. It ended up being easier than I thought it would be (no, really), but it has been nice to slowly add those ingredients back into my diet here and there. But now that I’ve made these positive changes to my diet, I would really like to maintain those changes. As a result, I’ve started looking at some of my favorite recipes and thinking about how I can modify them. One of the first recipes to go through a makeover was my beloved Chewy Chocolate Chip Homemade Granola Bar recipe. First I made the recipe gluten free and reduced the sugar by about 3 grams per bar. Then I took it a step further, which brings us to today’s recipe for homemade chocolate granola bars. 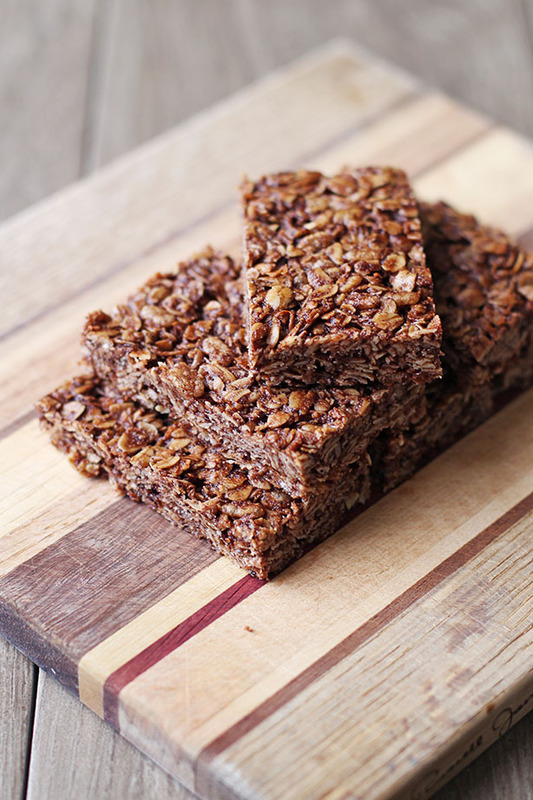 When I was working on reducing the amount of sugar in my original granola bar recipe, I was surprised by how much sugar was coming from the chocolate chips. I wanted to be able to take out the chocolate chips but still get a good chocolate fix. 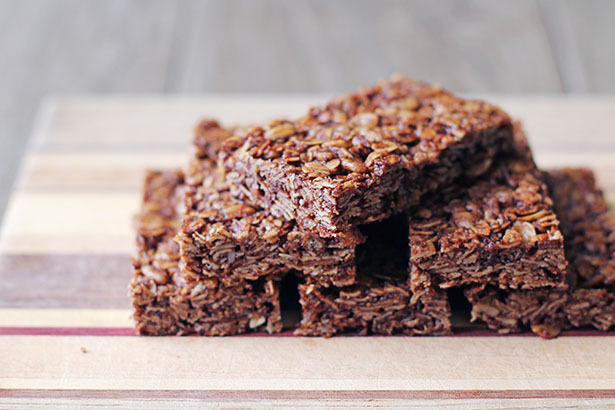 By removing the chocolate chips and adding cocoa powder to the granola bar, we still get that delicious chocolate flavor with even less sugar. I tried it and it totally worked. 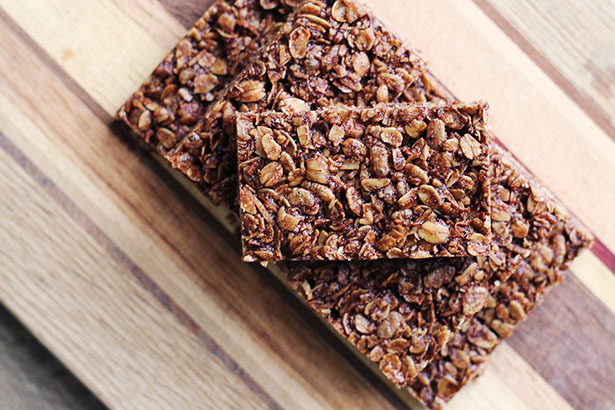 This recipe for homemade chocolate granola bars is awesome. My original recipe is a bit more chewy, but the texture on these chocolate bars is fantastic, a little chewy as well as a little crispy, and they don’t fall apart at all. The flavor is wonderful – I think I might even like these better than the original chocolate chip bars, which is really saying something. This recipe is gluten free and each bar contains about 8 grams of sugar, which is 5-6 grams less per bar than my original recipe. Woohoo! Please note that if you do not need the bars to be gluten free, you can in fact use regular all-purpose flour as a substitute for the oat flour. But if you want to go gluten free, stick with the recipe below using oat flour. Without further ado I give you Homemade Chocolate Granola Bars! Combine oats, crisped rice, coconut, brown sugar, oat flour, cocoa powder, and salt. Mix well. Line a large cooke sheet with parchment paper. Pour granola bar mixture onto the lined cookie sheet. Press mixture out into a large, uniform rectangle, about 9" x 13" (which will be smaller than the pan, you do not push the granola all the way to the edges of the pan). It is easiest to form the rectangle if your hands are wet. Bake for 15 minutes, rotate pan and bake for 14-15 more minutes. Cool completely before cutting. Cut into 24 bars, 8 rows x 3 columns. The coconut oil can be solid or liquid - whatever it happens to be sitting in your cupboard is fine! If you do not need these to be gluten free, regular all-purpose flour can be substituted for oat flour with the same measurement.